Against an ailing Devils team, the Washington Capitals were expected to come out on top in this one. They did just that and remained hot with a 3-0 win over New Jersey Friday. Braden Holtby was the biggest reason the Capitals won their sixth straight, as he backstopped them to victory with 25 saves and his third shutout of the year. He now has five shutouts in his career against New Jersey. The Caps again got off to a good start, getting on the board within the first 10 minutes for the third straight game with Andre Burakovsky scoring his 11th of the season less than three minutes in. He now has goals in three straight and points in five of his last six, while Travis Boyd, who got the secondary assist on the goal, is riding a three-game point streak. Though the Capitals held the lead, he first period didn’t go as well as planned. The Caps were unable to strike on three power play opportunities in the opening frame, including a two-man advantage that lasted 1:48. A lack of tape-to-tape passing and missed chances led to the Capitals being not only out-chanced 7-3 by the Devils, but only leading by one heading into the second. 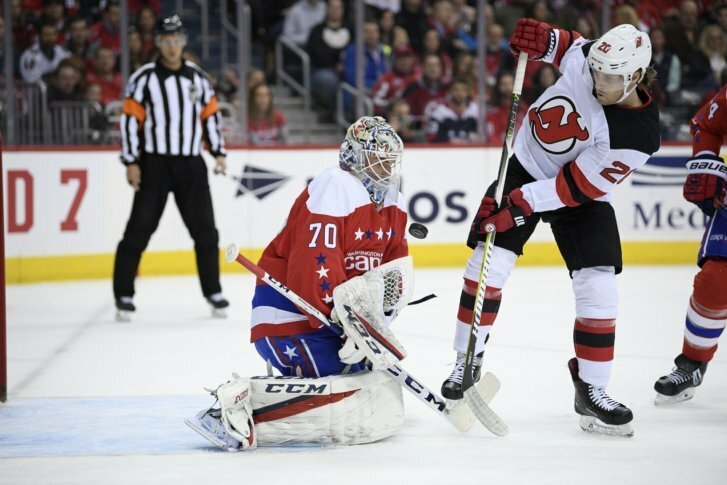 Despite a number of penalties between the two teams, neither team wouldn’t get on the board until the third period, when Nicklas Backstrom deflected in a point shot from John Carlson on the man advantage to make it 2-0. Washington now has a power-play goal in five of their last six games, and Backstrom has eight points in his last six games, including goals in two straight. Lars Eller put the final nail in the coffin with less than a minute remaining, making it 3-0 as the Devils went 0-for-6 on the power play. Mackenzie Blackwood finished with 33 saves on 35 shots. With the win, the Caps have retaken the Metro Division lead and have 87 points.